When you’re choosing what size dumpster you’ll need for your next project, one of the first questions you should ask yourself is, “How much does all my stuff weigh?” This answer is important because each dumpster provider has different weight limits, and the specific types of debris you’re throwing away also plays a huge role. What Determines my Dumpster's Weight Limit? Each size dumpster will have a different weight limit that the dumpster company will assign to each size. This weight limit could reference the limit that the dumpster truck can hold. The hoists on the trucks that are picking up and dropping off dumpsters are designed for certain amounts of weight, so the weight could be limited to the hoist’s abilities to lift. The weight limit could be the amount the dumpster company assigns. If you go over this weight, the truck may still be able to be lifted, but you will be overcharged because you exceeded the agreed-upon weight limit. For example, if your dumpster weighs in at three tons but you only paid for two tons of debris, you will be charged an overage fee. The fee could range from $25 to $100. What is my Dumpster's Weight Limit? What Does my Debris Weigh? How is my Debris Weighed? The dumpster company takes the dumpster from your site to the landfill. The truck with the dumpster will drive onto a scale at the landfill and the total weight of the truck, dumpster and debris is measured. 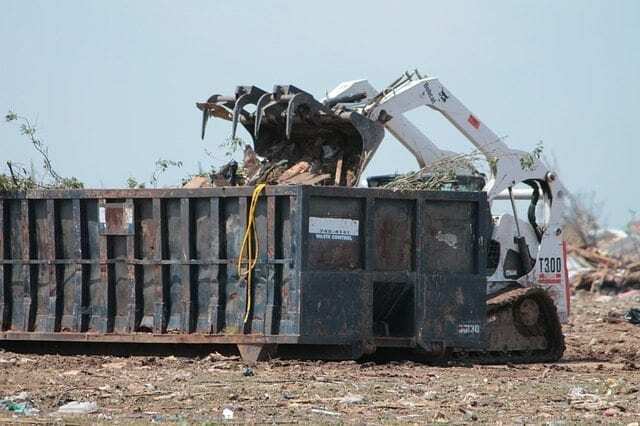 The truck will empty the dumpster and weigh again before leaving the landfill to see how much the truck and dumpster weigh without the debris. Then the dumpster company will know how much your debris weighed and you will be billed for that weight. Now that you know what dumpsters can hold and how much your stuff will weigh, choose your dumpster and get to work! Give Bargain Dumpster a call at (803) 573-0003 and we’ll get your dumpster rental on its way!